If there is one thing that most people experience in today's busy world, it's not enough relaxation. With multiple jobs, families to take care of, and the everyday tasks that take up our time, it can be hard to find a way to just relax and let our minds feel peaceful, yet invigorated. 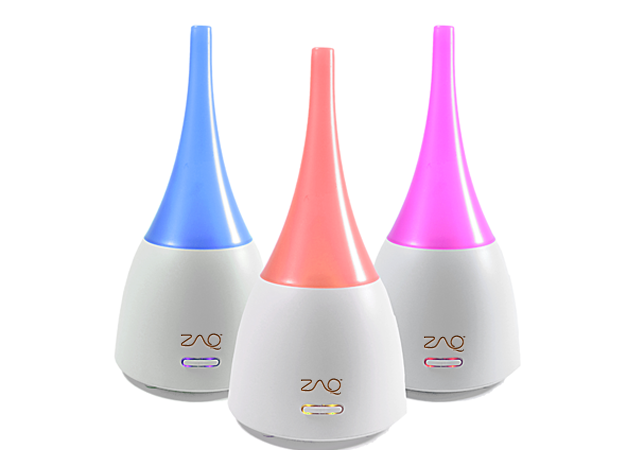 With the Zaq diffuser, it's now possible to feel the effects of healthy aromatherapy in our own home. The Zaq uses LiteMist technology which is an innovative way to break up the blending of essential oils and water into microparticle mist. This is then dispersed into the air so you can enjoy your favorite healing essential oil or your favorite fragrances without having to go to a spa. It not only adds healthy ions into the air but it humidifies as well. The Zaq Dew Aromatheraphy Diffuser for instance has key benefits making it safe to use such as an automatic shut-off. It can operate up to three to four hours without condensation and has a soothing cool color changing LED light that relaxes your environment. Not only does it make your mind feel at ease but it also soothes dry skin with moisturization and delights your senses with the fragrances you choose. When you choose your Zaq Diffuser from Bombay Electronics, you get 100% secure shopping with their low price guarantee. There's no sales tax and you get free tech support for all of your questions. The Zaq Dew Aromatherapy Diffuser comes in a clean, white look and the light changes colors in a relaxing, delightful way. If you want to learn more just contact us and we'll be glad to help.